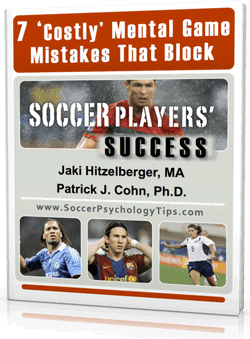 Playing in a big soccer game can present several mental game challenges for soccer players. You have trained all year round and the end of the season tournaments often count the most for high school, club, or college teams. The pressure to perform increases during these times and mental preparation is more important than ever. Pressure can cause you to focus on results, tighten up and try too hard. During big games, it is common that players and teams become anxious, disorganized, and try to force goals. The problem is that you are forgetting all of the tactical strategies that have brought you to this point. Anxiety interferes with focused decision-making, leading to poor execution, and reduced performance. When the season is on the line with a championship game, do you rise to the occasion? The best athletes and teams do raise their level of performance in big games. They thrive on big games, stay organized, take control of the ball, and keep formation. How can you or your team do this? Mental preparation is key to remaining relaxed and composed under the pressure of a big game. Develop a consistent pregame routine that instills confidence. A pregame routine will help you focus on what you need to do to perform. Taking time during warm-ups to mentally prepare will create a confident, focused, and relaxed mindset. Focus on your game not your competitors. Particularly in big games, soccer players tend to make comparisons to their competitors and thus psych themselves out. It is important that you reinforce your strengths, focus on your pregame preparation, and avoid making negative comparisons to competition. Focus on the process, not results. Focusing on results causes you to think too far ahead and sets too many expectations for competition. 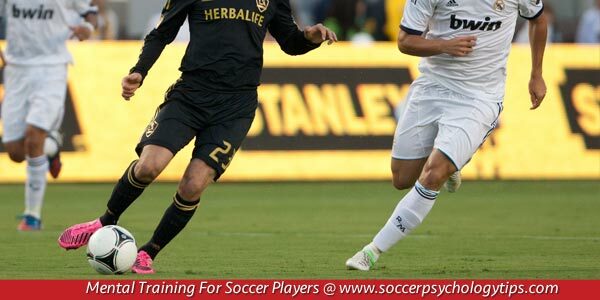 You will start to force passes instead of slowing down the game and taking control. Have trust in yourself. Some athletes lose trust and tighten up in the big game. This can cause you to try too hard and focus on mechanics. You want to play freely and trust in your skills. Yes, this is an important game for your team, but the key is to treat it like any other game. You don’t want to place too much importance on one game, which can lead to added pressure, a lack of focus, and trust in your game. Become mentally prepared by focusing on your pregame routine, avoid thinking about results, and trust your training and ability.